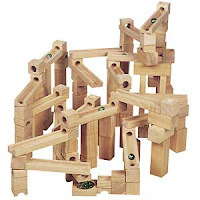 A Maze and Marbles is an amazing toy made of ecologically harvested hardwood grown on plantations. This toy fascinates young and old alike. Available for about $60.00, A Maze and Marbles comes with 100 pieces to build fantastic creations. If you decided to purchase this toy, you will need a basket to keep all the parts in. The cardboard box it comes in will not be sturdy enough for storage. I suggest toys be stored in baskets, rather than plastic bins, to minimize the amount of plastics in the home. At first, I thought the pieces were too complicated for my adult brain to assemble. By looking at the picture on the box, I was able to start a tower that my daughter finished. After one demonstration, my five-year-old daughter is able to build towers higher than her two-year-old brother, who loves to drop the marbles on the top and watch gravity at work. The possiblities are endless with this toy! For example, build a Thomas Train track through the maze and expand the play.